OKLAHOMA CITY (AP) Anthony Davis set the New Orleans Pelicans’ career scoring record in style. The versatile 6-foot-10 big man scored 43 points to help the Pelicans beat the Oklahoma City Thunder 114-100 on Friday night. At 24 years old, he passed David West on the franchise’s scoring list and has 8,702 career points. Davis earned his points against Oklahoma City’s Steven Adams, one of the league’s most rugged interior defenders. He scored 16 points in the fourth quarter to help the Pelicans pull away. Davis passed West to become the franchise’s rebounding leader on Jan. 28, and he added 10 more boards to his total on Friday. E’Twaun Moore added 26 points for the Pelicans. New Orleans had lost two straight since All-Star DeMarcus Cousins was lost for the season with a left Achilles tendon rupture. They righted the ship by shooting 51 percent from the field against the Thunder. Oklahoma City’s Russell Westbrook had 16 points, 14 assists and 10 rebounds for his 16th triple-double of the season. Adams had 23 points and 12 rebounds for the Thunder, who lost their third straight after an eight-game winning streak. Oklahoma City’s stars couldn’t find their shooting rhythm. Westbrook shot 7 for 21, Paul George 4 for 16 and Carmelo Anthony 6 for 17. The Thunder played in Denver the night before and lacked energy late in the game. Westbrook approached a triple-double in the first half with nine points, nine assists and seven rebounds to help the Thunder take a 58-54 lead at the break. The Pelicans seized momentum early in the third quarter. New Orleans led 97-89 in the fourth when Westbrook checked back in after a rest. 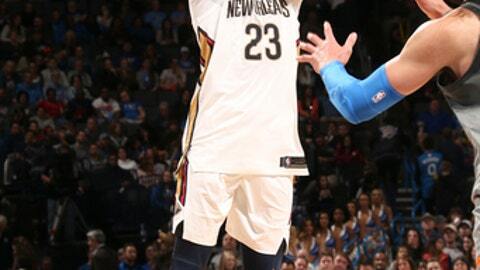 Westbrook made a 3-pointer with just under two minutes remaining to cut New Orleans’ lead to seven, but Davis hit a 3-pointer at the other end, then made another shortly after that to put the game out of reach. Pelicans: Gentry was called for a technical foul in the second quarter. … Gentry said during his pregame media session that Cousins had been putting up MVP-type numbers. Cousins averaged 25.2 points, 12.9 rebounds and 5.4 assists per game before his injury. Thunder: Adams scored 13 points on 6-for-9 shooting in the first half. … Adams reached 3,000 career points. He joined Kevin Durant and Serge Ibaka as the only Thunder players with at least 3,000 career points and 350 career blocks. … G Raymond Felton was called for a technical foul in the fourth quarter. … G Terrance Ferguson was ill and played just 11 minutes. Westbrook nearly added another double-figure statistic to his line – he had nine turnovers. The Thunder had 16 turnovers as a team. The Thunder have struggled to stop opponents since Andre Roberson, a second-team All-Defense selection last season, suffered a season-ending left patellar tendon injury. They won their first game without him against Philadelphia but followed that with three rough outings. Oklahoma City lost to Washington, which was playing without All-Star John Wall, then gave up 127 points in a loss to Denver before losing to the Pelicans. Pelicans play at the Minnesota Timberwolves on Saturday. Thunder host the Los Angeles Lakers on Sunday.